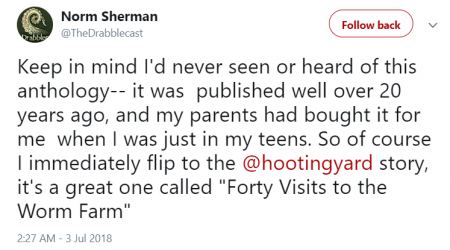 Hooting Yard is “a transformative experience”. So says Winston Alden, and he explains why in Frank Key’s Hooting Yard and the Tradition of Grand English Nonsense, here. Setting the tone for a new year here at Hooting Yard, High Art & Mr Key in perfect harmony. Snapped in the National Gallery, Washington DC, 29 December 2017. It is one of the enduring mysteries of contemporary life. How can it be, I hear you cry, that there is not a blockbusting Hollywood franchise based on Hooting Yard? Imagine for a moment that there existed a dimwitted action-packed film, filled with CGI explosions and the like, in the spirit of, say, Alien vs. Predator, but in this instance called Babinsky vs. 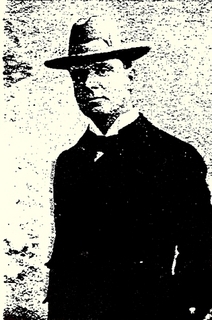 The Grunty Man. Clearly the moviegoing hordes would be queueing up at multiplexes across the land to lose themselves for two and a half hours in such a spectacle. So why has Mr Key not yet had a call from a Hollywood mogul? It is, as I say, an enduring mystery. I am sure, too, that a film entitled Tiny Enid : Plucky Tot could spawn an endless string of sequels. Come on, Hollywood! Get your act together! To date, only the visionary film-maker Miss HatHorn has used Hooting Yard as her source. If you have not yet seen A Recipe For Gruel, watch it now. One of the places I visited on my recent holiday was described to me as “an insolent little town, turning its back on the tortured sea”. Tortured the sea may have been, but it was neither dolphin-torn nor gong-tormented, though given my guide’s turns of phrase perhaps it ought to have been. 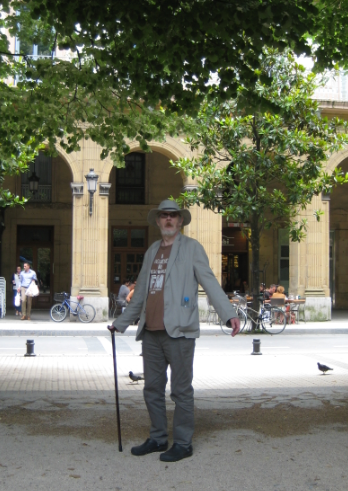 Among the sights of the town – snapped by Pansy Cradledew – was this absurd flaneur prancing like a ninny along the boulevards before posing for the camera. Just as I locate my mislaid mojo, and return to tippy-tapping, I’m afraid I must announce a brief hooting hiatus (hootatus?). I will be away in foreign climes, dressed like Fitzcarraldo, for about a week and a half. You can spend that time exploring the archive, and I will resume regular posting upon my return. Crikey! I think that must be the longest period of eerie silence at Hooting Yard since records began fourteen years ago. Much has happened in the interim. Well … not that much. There has been ongoing eye trouble (not yet resolved), regular shows on Resonance – available on Mixcloud – where I have been looking at past investigations of plums and swans and Captain Nitty, and a brief trip to Scotland. Oh, and I was asked to name a trawler. To ease you back in to what they call the Hooting Yard Experience, I bring you the work of Charles Anthony. I have no idea who Mr Anthony is, but he is clearly a very sensible man. Please take a minute to marvel at this and this. Occasionally I like to make note here of mentions of Hooting Yard from elsewhere in Interwebshire. 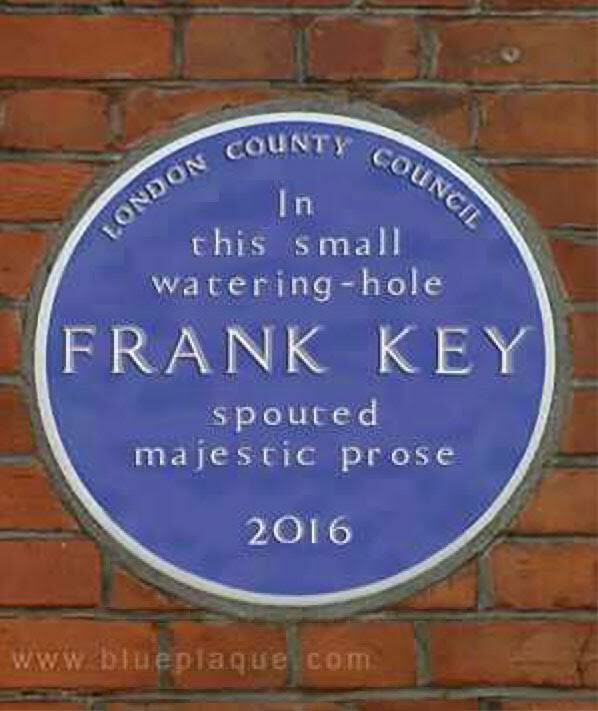 I see this as a boon to scholars in years to come, who will not have to look quite so hard for references when compiling the fat magnificent doorstoppers devoted to Mr Key with which bookshelves of the future will surely teem. 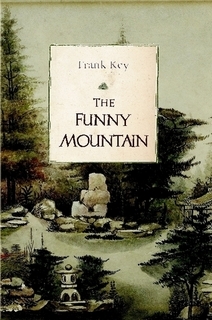 Frank Key is an odd, odd author. South Coast minstrels The Flying Aspidistras perform a rousing version of Dismantled Wooden Myrna Loy. Watch it here. There I was, thinking that my film career began (and, thus far, ended) with Miss Hathorn’s splendid adaptation of A Recipe For Gruel in 2014. But what is this I find, lurking in a remote corner of Het Internet? Why, it is a film entitled Creekside Artists, made by Endwell Productions as long ago as 2006-7, the soundtrack of which is a direct recording of Mr Key babbling away on the radio about Dobson, Marigold Chew, squirrels, and seagulls. I had no idea this existed. I suppose it also counts as one of my rare forays into the world of ART. The eerie silence of the past week or so has not been occasioned by the usual vacancy-between-the-ears syndrome. On the contrary, Mr Key has been a busy buzzing bee. I received a commission from the splendid Norm Sherman of the Drabblecast to write a Lovecraftian tale for the podcast’s annual celebration of the Rhode Island master of purple prose. 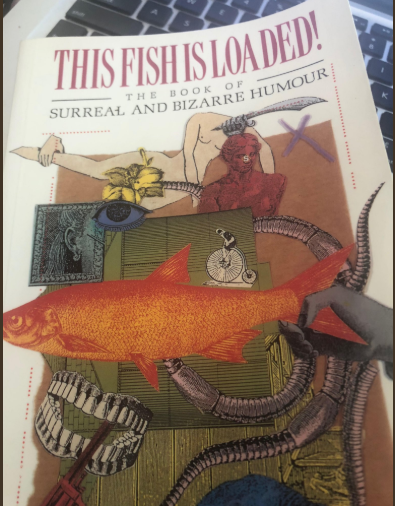 Thus I spent several days immersed in the world of shoggoths and mad Arabs and hideous crawling chaos (with tentacles) and then another couple of days tippy-tapping a tale that I hope will prove a fitting homage. 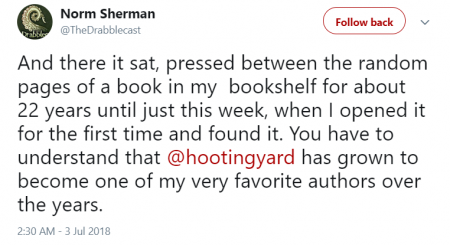 The text will be posted here after it has appeared on the Drabblecast. I now need to delovecraftise my brain, which is easier said than done. After reading just a couple of stories, it is very easy to get completely sucked in by all that nameless miasmic horror. 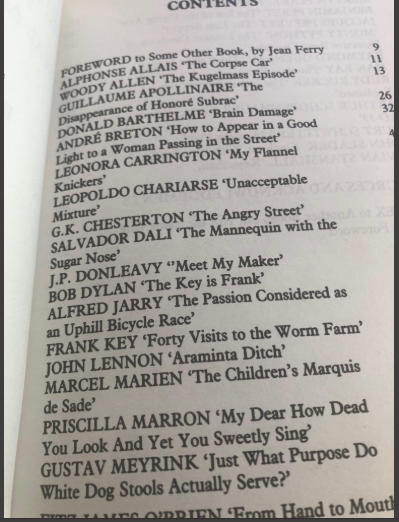 Perhaps I will hoist myself out of it by writing a twee story about Popsy the Pony in a buttercup-splattered meadow, or some such winsome tosh. Watch this space. 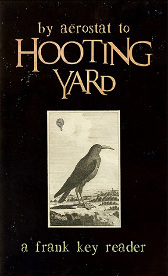 I have just discovered this rave review of Hooting Yard by Madeleine Swann – what an excellent surname! – who is a British “bizarro, horror, surreal, and weird fiction writer”. I do not know if she writes about swans, but I hope she does. Anyway, she has nothing but kind words to say about Mr Key and his prose, and she includes some links to stories featured on the Drabblecast. 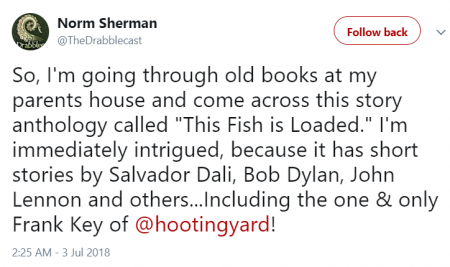 They include Norm Sherman;s matchless reading of “Far, Far Away”, which Ms Swann describes as “[not] so much science fiction as a bowl of madness”. If you have not heard Norm intone the words “magnetic mute blind love monkeys”, then do so right now. You will not regret it. And many thanks to Ms Swann. Clearly a very sensible Mann. 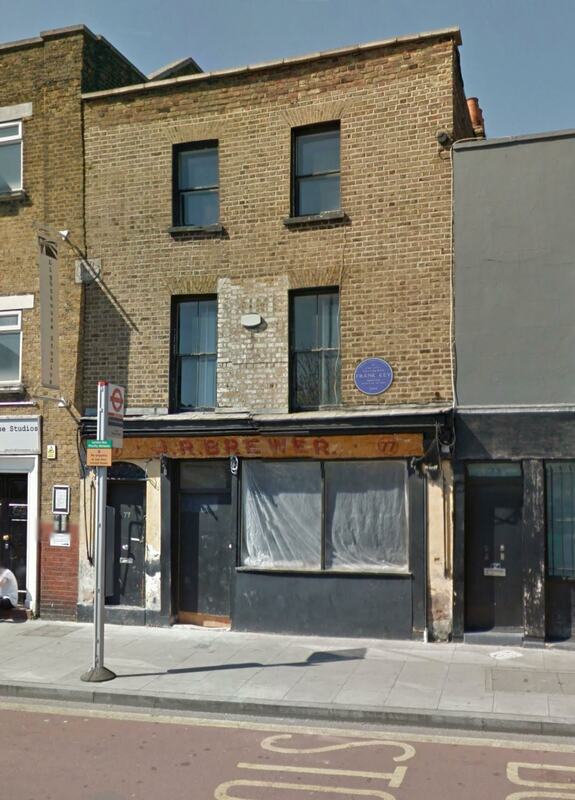 I mentioned my hope that one day a blue plaque would commemorate the site of last week’s live appearance at Brewer’s Bar. Jonathan Coleclough, who attended that night, has been out and about with his box camera and reports that the plaque is already in place.